Barbel Fishing Orellana, Extremadura. Spain. 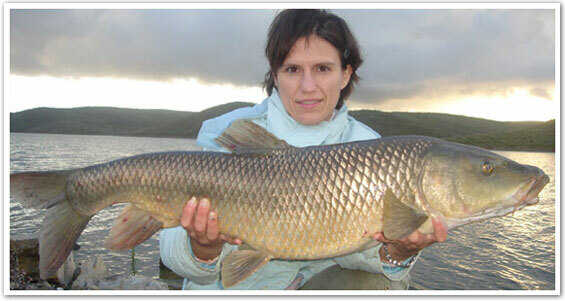 The Guadiana River and its lakes are abundant with Barbel, possibly providing us one of the best Barbel venues in Europe. We have banked Barbel to over 30lb. This river system provides a perfect sanctuary for these carnivorous fish, the water is teaming with natural food including crayfish, muscles and silver fish, a perfect staple diet. It is home to several strains of Barbel, the main two being the Common and Comizo, present to over 20lb and 40lb respectively. Pursuing them is an awesome experience for even the most accomplished angler. These Barbel are strong hard fighting fish that have probably never encountered a hook before, they will strip yards of line off you whilst heading for freedom. New packages coming soon including a River section option. 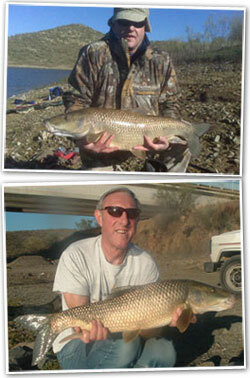 Experience the fantastic Barbel fishing this Extremadura has to offer, not only the fishing but the scenery. Our local area has mile upon mile of bankside, not only the out of the way river sections but these massive lakes are also home to Barbel. One of our guides in a 4x4 vehicles will transport you from the accommodation to proven productive swims, many out the way places. Targetting these barbel on medium-heavy tip rods is great sport, especially as they go so big. At times if its slow we can use 2 rods, but when they are on it its down to one. All rods, tackle and equipment is provided except reels, alarms, and end tackle. Coolboxes, chairs, unhooking mats,as well as an ample amount of bait including quality pellet and hook baits, its all provided. Accommodation in a typical Spanish 'Casa Rural' or local Hotels. All rooms have TV, heating/air-con and free wifi. The Casa Rural has an open fire livingroom and even a terrace BBQ area. A continental buffet breakfast is also included in the package price. Tip - Barbel Rods, Korum River pods, Landing nets and unhooking mats. Note. Winter is the most productive time for Specimen Barbel fishing, packages are available from October through to April. **All necessary equipment except for end tackle and reels. Based on 2 anglers, discounts are available for groups of 3 and above. Prices in EUROS and are subject to availability. Craig 50 has been successfully involved in guided fishing on Spanish waters now for 16 years, originally on the River Ebro before relocating to Extremadura over 16 years ago. He has fished from a young age and pursued Specimen Carp and Barbel for over 30 Years.